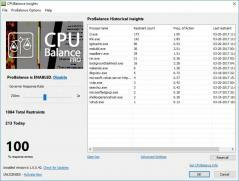 CPUBalance is a small utility that monitors and prevents processed from using too much CPU in order to speed up your system’s responsiveness. The tool runs in the system tray and automatically sets up as a Windows startup item. Once you open the main window from the system tray icon you can see all processes organized by restraint count. Also, it displays the name, last time of restraint and frequency of actions for each item. Any process can be added to an exclusion list so it will be ignored by CPUBalance. The application logs all actions and you can filter results as well as save it to a CSV file. Furthermore, the program allows you to manage excluded processes, set it to play sound on process events, prevent it to act on system services, as well as foreground, children of foreground and normal priority processes. As a pure uninstall program, IObit Uninstaller features himself in the market without install required to remove programs.